TomatoLove continues, it is soup week, and it is also Le Creuset giveaway week! I must say that, even with the temperatures where they are, I have been looking forward to soup week. I really love gazpacho but I had never made it at home. And the idea for this recipe has been floating around in my head for some time. I just love roasted peppers and spicy poblano peppers have such a deep (and spicy!) flavor when they are roasted. And the heirloom tomatoes right now – oh my – are so amazingly delicious. They are gorgeous and too good to pass by at the farmer’s market. I can’t believe that this week marks the halfway point of our #TomatoLove Recipe Exchange. As you probably know, Ali (Gimme Some Oven) and I are partnering with International Justice Mission for their Recipe for Change Campaign which is raising awareness for tomato farming, fair working conditions and fair compensation. You can read more about it on their website, and you can get involved in various ways, it’s truly very simple and each person can make a significant impact! 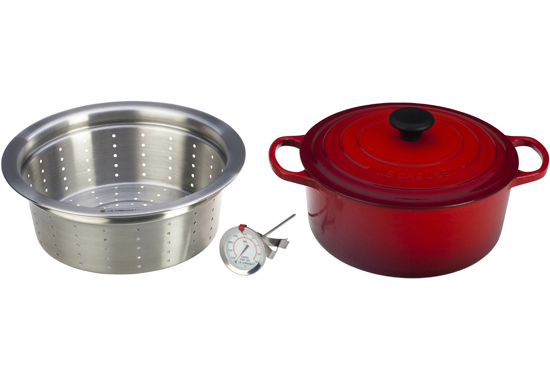 And to celebrate soups, Le Creuset is giving one reader a Simmer, Steam and Fry Set valued at $279! The French oven is 5.5 quarts, and the steamer basket fits inside. Be sure to visit Le Creuset on the weband thank them for their generosity in our campaign! And make sure to share your favorite tomato soup recipes below and check out the details for entering the giveaway! A quick and simple gazpacho recipe with heirloom tomatoes, roasted poblano peppers, bell pepper, cucumber, onion and garlic, and lots of fresh herbs. A perfect cold soup recipe for summer. Preheat broiler. Place the poblano peppers on a baking sheet and place them under the broiler. Broil until the skin is blistered and charred, rotating with tongs as necessary. They should be completely charred in about 20 minutes. Remove the charred peppers from the oven and place them in a glass bowl and cover with plastic wrap. Let them sit and sweat for about 20 minutes, the skins will begin to pull away from the flesh of the peppers. Remove the raining skins, open the peppers and discard the seeds and roughly chop the flesh. Meanwhile, in a small bowl, stir together 1/2 cup of the onion, 1 cup of the tomatoes, 3/4 cup of the cucumbers, 1/2 teaspoon salt, 1 teaspoon of the lemon juice, 1 tablespoon of the olive oil, and the parsley. Cover with plastic wrap and refrigerate until ready to serve. In a food processor, combine the remaining onion with the remaining lemon juice, the 1 tablespoon salt, the garlic, thyme, cilantro, basil, vinegar and bread. Pulse the mixture a few times, scrape down the side of the bowl and then puree until the mixture is smooth, about 2 minutes. Add the remaining tomatoes and cucumbers along with the bell pepper and roasted poblano pepper. Puree until the mixture is completely smooth, about 4 minutes. Season the soup with pepper and transfer to a large bowl, cover and refrigerate for at least 1 hour or up to 1 day. Just before serving, return the soup to the food processor. Turn the processor on and stream in the remaining 3 tablespoons olive oil and puree for 1 minute. Taste and adjust the seasonings with salt and pepper if necessary. 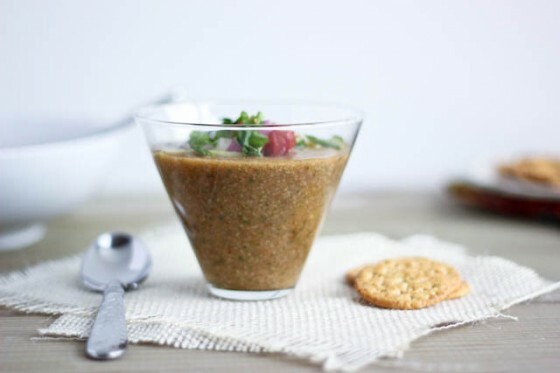 Ladle the gazpacho into tumblers or bowls. Garnish each portion with the reserved tomato-onion-cucumber mixture and a drizzle of olive oil. This giveaway is now closed. Congrats to Lacey of Small Town Cookie who shared her Roasted Tomato and Zucchini Soup! Disclaimer: This giveaway is being sponsored by Le Creuset. Contest is open to US residents only. For my full site disclosure, click here. This post contains affiliate links. Ok I really really need to share my tomato love this week… and share a recipe. I want that Le Creuset! 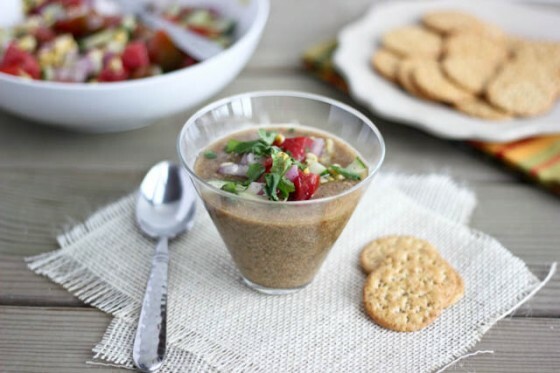 This gazpacho looks amazing, and the perfect summer dish! Love the addition of roasted poblanos! Great giveaway this week! Gazpacho is such a fabulous summer soup. I love the roasted poblanos here, what a flavorful kick. Gazpacho is perfect on a hot summer day! I love this post!! Gazpacho is the perfect soup for this insane weather we’ve been having! Also, yay for a Le Creuset giveaway!! What a great campaign! There is a lot going on with #tomatolove this month. Not sure if the soup has to be a new one posted in July. If you want there is another #tomatolove link hop co-hosted by the Lovebloghop group – you’re welcome to post your July tomato recipes there too for more exposure. That link hop closes tomorrow. Oh, I adore gazpacho. I actually made a cherry one this weekend. After spending a semester in Spain in college, gazpacho is the ultimate “memory” food for me from that time. When it’s made correctly, there really is no better summer starter in my opinion 🙂 Love the roasted peppers in this! Ur killin me! This looks so good! Remind me can we link up old recipes from our blog if we add in the link to Tomato Love or do you just want new posts? I’m not a big gazpacho gal but THIS might make me believer. Oh wow Cassie – this looks so light and refreshing! This looks awesome!! poblano peppers FOR THE WIN. This is just the perfect summer recipe, just gorgeous! Aw girl, it’s been way too long since I popped by your blog. I adore gazpacho and I love the idea of the poblanos. Gorgeous recipe! It’s just right for all my ripe tomatoes!! Love the flavors combo in this gazpacho, Cassie! Yum! What an awesome giveaway! I’ll have to research some tomato soups ASAP! 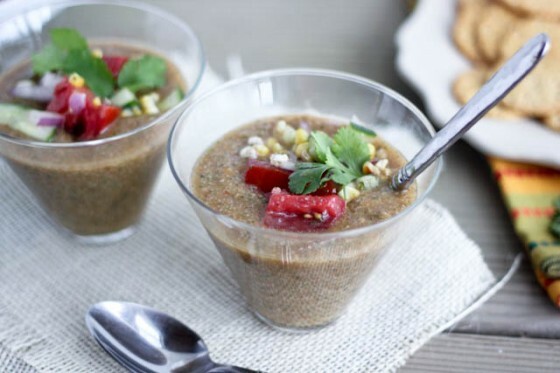 And this gazpacho looks so incredibly flavorful! Will definitely have to try this. 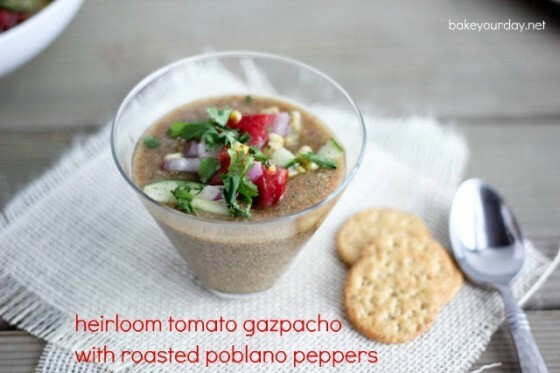 Great idea to give this gazpacho some smoky heat with the roasted poblanos. This sounds like the perfect summertime soup to me! I love a good gazpacho, totally underrated. Beautiful! I love gazpacho!! It definitely makes the summer more bearable with something cold and refreshing such as this!! Tomato soups are my absolute favourite and I love the smokiness that you added with those poblanos. Perfect! Gorgeous soup! Love the roasted peppers in there, they much give it so much more flavor. I’m really picky about gazpacho, but this looks soooo good! Looks really flavorful! Heirloom tomatoes are my best friend. Never been a huge fan of gazpacho, but with heirloom tomatoes and some tasty poblanos it’s gotta be the best gazpacho! Love this. I’m in desperate want of a gazpacho recipe that doesn’t make me gag after one bite- maybe this will be… The One!!! Sounds like a delicious gazpacho, loving everything in it! This looks like a perfectly refreshing summer meal! What a great gazpacho, I love all the flavors you incoporated here! Look delicious, I will be sharing my recipe soon. BA-zinga! This looks so refreshing and delicious! I need more gazpacho recipes in my life so consider this one bookmarked! This gazpacho looks so flavorful Cassie! Beautiful photos! I linked up a recipe for Dilly Tomato Soup! I tweeted about the recipe exchange! You know, I’ve never made gazpacho at home either, now that I think about it! I love the roasted red peppers in this. Yum! Poblano peppers are my favorite and I know I would love this soup! I just love gazpacho. Especially in the summer when tomatoes are at their best. I’ve been canning loads of them lately and am looking forward to using some to make my Tomato-Tarragon Soup (http://www.lanascooking.com/2011/01/26/tomato-tarragon-soup/) on a cold day in the winter! Perfect summertime soup and I love the roasted poblanos! So flavorful! Gazpacho is my dad’s favorite soup. I haven’t had it often, but yours looks fantastic, especially with the roasted peppers! What a great giveaway, Cassie! I wish I could get my act together to participate 🙂 But since I didn’t, I’ll just admire your fabulous gazpacho…one of my favorite summer treats!!! I am digging all your tomato love! 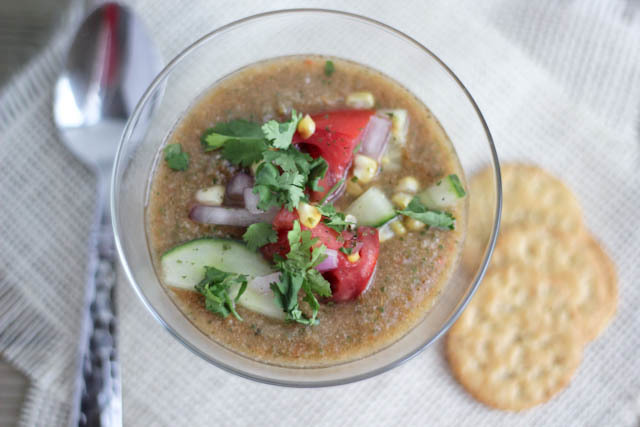 Gazpacho is the perfect way to beat the heat! YAour gazpacho looks delish. I love all those fresh chopped veggies floating on the top too. That cucumber looks good. I just linked my Beer Cheese Tomato Soup and I added the tag to my Instagram photo! I added the hashtag to my pin of your gazpacho on my Summer Eats Pinterest board. Here’s the link to my recipe. I tweeted the required information. I shared a photo on instagram. I don’t currently have a blog, so I’ll post my recipe here. For this entry I made a Fatoosh-inspired gazpacho using heirloom tomatoes from my garden (Mortgage Breaker variety). Makes approximately 8 cups depending on size/amount of tomatoes used. 1. Prepare tomatoes: Fill pot with water, set over high heat and bring to a boil. Make an X with a paring knife on the bottom of the tomatoes. Drop the tomatoes into the boiling water for 15 seconds, remove and transfer to an ice bath and allow to cool until able to handle. Remove and pat dry. Peel, and coarsely chop. Set aside in food processor or hand blender bowl. 2. Coarsely chop cucumber-mint. Set aside with tomatoes in food processor or hand blender bowl. 3. Blend tomatoes-mint until smooth. 4. Add sumac-pepper. Blend to incorporate. 5. Cover and chill for 2 or more hours (overnight is fine). 6. Serve with toasted pita bread. Pita Bread: Preheat oven to 350 degrees F (175 degrees C). Coat with thin layer of olive oil if desired. Toast pitas 5 to 10 minutes in the preheated oven, until crisp. Remove from heat, and break into bite size pieces. Notes: I did not remove seeds from the tomatoes. You are welcome to process/blend tomatoes separately and strain seeds prior to combining with tomatoes with additional ingredients. This recipe looks fabulous! I had to pin it in my “vegetarian” board. Yum!